Product #20751 | SKU 307 | 0.0 (no ratings yet) Thanks for your rating! 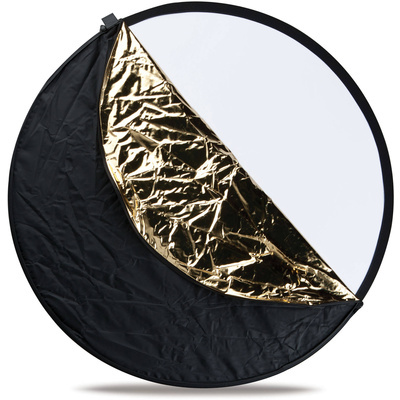 This Westcott 30" 5 - in - 1 Reflector is an ideal way to soften contrast or add warm or cool tones to your subject. The 5- in - 1 is built around a double riveted diffusion frame that allows you to subdue harsh illumination like sunlight. The gold/silver side of the reversible sleeve gives you warm or cool reflected light to balance open shade or late afternoon light. The white/black side of the slip cover provides soft, neutral fill light or in the case of the black side provides "negative reflection" to strengthen shadows and contrast. The reflector includes a fabric carrying case.